The Colorado River is the primary water source for more than 30 million people in the United States and Mexico. Recent studies that project streamf low changes in the Colorado River all project annual declines, but the magnitude of the projected decreases range from less than 10% to 45% by the mid-twenty-first century. 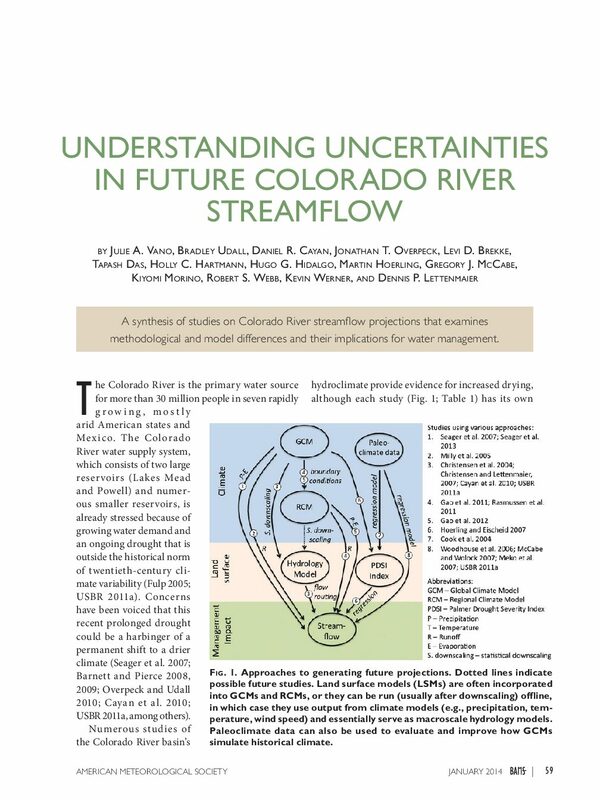 To understand these differences, we address the questions the management community has raised: Why is there such a wide range of projections of impacts of future climate change on Colorado River streamflow, and how should this uncertainty be interpreted? We identify four major sources of disparities among studies that arise from both methodological and model differences. In order of importance, these are differences in 1) the global climate models (GCMs) and emission scenarios used; 2) the ability of land surface and atmospheric models to simulate properly the high-elevation runoff source areas; 3) the sensitivities of land surface hydrology models to precipitation and temperature changes; and 4) the methods used to statistically downscale GCM scenarios. In accounting for these differences, there is substantial evidence across studies that future Colorado River streamflow will be reduced under the current trajectories of anthropogenic greenhouse gas emissions because of a combination of strong temperature-induced runoff curtailment and reduced annual precipitation. Reconstructions of preinstrumental streamflows provide additional insights; the greatest risk to Colorado River streamf lows is a multidecadal drought, like that observed in paleoreconstructions, exacerbated by a steady reduction in flows due to climate change. This could result in decades of sustained streamflows much lower than have been observed in the ~100 years of instrumental record.